Alright guys word problems can be some of the most intimidating problems you'll come across in your Math homework and I'm a Math teacher so I know that a lot of students tend to just skip them. Please please don't skip them I promise if you try you guys you can do them. 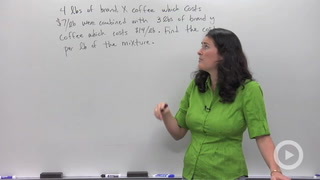 There's a certain kind of word problem we're going to look at today and that's where you're looking at the amount of cost and the amount of quantities that go into a mixture. It's really relevant for anyone who goes into any kind of selling of products whether it be like a food item, like a mixed coffee brand where you're combining like Colombian with Brazilian or something and you have to figure out how much to sell. Or maybe if you're making like makeup and you have like one product that's really expensive that you use as half of your ingredients the other ingredients are really cheap and you want to figure out how, how too figure out what the price of your selling item should be. That's where you're going tot use this kind of a problem. Here is a kind of a formula that might help you when you go through this. What you're going to do is have 2 quantities or ingredients that are being mixed together to give you your mix. So you have the amount or the quantity of your first item times its price plus the amount of quantity of your second item times its price, that's going to be equal to the amount of the mixture times the mixture price. It makes sense when you're looking at it now but I bet when you start seeing some problems you might get a little confused. So please write this down somewhere where you can refer to it when you're going through your homework or watching the upcoming Brightstorm videos.